We can work with a project's owner, an interior designer, architect or with a project's dedicated representative. We are well versed in the outfitting process and are entirely flexible to your needs and style of working. Where will the brief-taking happen? What will I get following our brief taking session? Having listened carefully to your brief, your Project Manager will create a personalised presentation of luxury products, specific to you. At this stage, you may be looking simply for inspiration, so a general presentation by product type may be most appropriate. Alternatively, we can tailor it precisely to your needs. We'll create an arrangement that is admired and unique - you can also utilise our in-house Design Team to create something truly personal. Depending on your location and what is convenient, we will either send these to you via email or beautifully bound as a high-quality printed version. Can you work with short lead times? We can do, this would depend on the detail of your project. Depending on what you are looking for, some of our suppliers hold stock of individual products. The best thing to do is to make contact with us and let us know your ideal delivery dates. We'll always do our best to meet your requirements. Where are you based, do you have a shop? Our UK Headquarters, premier Showroom and Logistics Warehouse are all in Manchester, England, located a mere 2 hours from London. We are very easily accessible via plane, car and train. As a global company, we also have touch-points in Albany, The Bahamas, and Marbella, Spain. What can I see in your Albany and Marbella show spaces? We are showcasing a range of some of the luxury products we supply in both locations and have a member of the team present to introduce you to our service, in person. When you decide to embark on a project with us, you are assigned a personal project manager who is an expert in their field. This will be your point of contact for the entire project, meaning you only have to communicate with one company rather than a number of suppliers. How do you take my brief? Does this mean you could travel to me? During your project, we would be delighted to travel to attend meetings of any kind. Full details of this can be found in our Service Level Agreements, available at request. This is a hard question to answer, as each project is so varied. Some projects can be delivered in as little as eight weeks; some take years. It all depends on the size, the number of rooms, whether the products are custom, or branded, and at what point we've been introduced to the project. 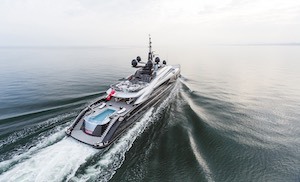 We're more than happy to talk this through with you if you'd like to gain a time estimate for your project, whether that's a yacht, plane or home. We have absolutely no problem signing NDAs from our clients' and ask that our suppliers do the same to ensure that any information you give us, remains secure and confidential. What are your showroom opening times, do I need to book an appointment? We ask visitors to our showroom to please visit by appointment only. Please call +44(0)161 876 5356 to arrange your appointment between Monday - Friday, from 9 am -5.30 pm. Why is your service different from your competitors'? Our team delivers unparalleled care and attention, exceptional knowledge and a genuine passion for our craft. The service we provide makes the Glancy Fawcett experience unique. These FAQs should hopefully give you a deeper understanding of what we do, and how we do it. What's the benefit of working with Glancy Fawcett over going directly to suppliers? We are a one-stop-shop. We offer incredibly competitive commercial rates and handle every element of your project from curating the products you'd like to quality checking them and delivering them directly to you. Do you hold stock? Can I buy one-off purchases? We have more than 7,000 product samples in our showroom, however, we do not hold multiple stocks of each item. We can occasionally order individual products for our clients'; however, we are not always able to offer a trade price for these items. Do you design custom products? We have an experienced in-house Design team who work hard to create something that is truly unique to you. Please see 'In-House Product Design' for detailed information on this service. Do you have a complete product brochure? We have a complete range of general product presentations, product brochures, and can also make specific presentations just for you. Can you supply fitting out pieces? When you decide to proceed with an order for tableware, we will then ensure that all the necessary fitting-out pieces are delivered as quickly as possible, if you need them. Can you advise on quantity? From our experience outfitting more than 450 superyachts, 150 residences and 100 private jets, we have developed an approach of outlining what we feel you may need, based on your brief. Derived from your General Arrangement drawings or floorplans, we'll show you a suggested list of items and the quantities required for each area onboard the yacht, aircraft or throughout the residence. Can you loan me samples of existing products? 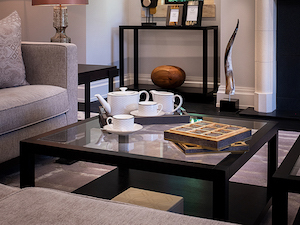 Having worked with you on your brief, we will happily send out a tailored selection of the existing samples we have in our showroom collection when they are available, subject to our normal terms and conditions. We will happily re-polish silverware we have supplied in the past for a competitive rate, please do get in touch for further information. Can you fix chipped glasses? Although it is possible to remove chips from crystal, the process of shipping and returning the goods, alongside a resultant finished crystal doesn't make this process a very economical one. We often advise purchasing new crystal as a more economical solution. Do you sell designer brands? We have lasting partnerships with the world's most respected and desired designer and artisan brands. As a result, we have an unrivalled product library. Can I re-order products in the future? We itemise and store your past orders, specs and quotes, so you can easily re-order, even if the initial project was as much as ten years ago. Can I see your products in person before I buy? Of course, we welcome visitors to our showroom and also are able to send some samples to you. Please see 'Product Samples' for more information. Can you advise on sizing? For items such as bed linen, dinnerware and tableware such as charger plates, table runners and placemats, we offer a sizing service to help recommend the right sized product for your project. For example, if you have a 170 cm bed, we would advise what size your pillowcases and bed linen need to be, considering shrinkage too. If you have any questions, our experts are here to help. Do you have a bed measuring service for unusual shapes? Should you require us to visit your project to make any templates or do any measuring for your beds, we would be happy to measure the mattress ensuring your bed linen fits. We also offer handy advice over the phone or via email for measuring beds if you need it. When you are ordering products, we can also produce samples of certain products. Where a sample is not possible, we will provide a sample of a similar product to demonstrate the quality alongside a design concept of the product you are ordering. Do you supply gallery ware? In our experience, this is a specialised area as the kitchens and galleys on our projects are normally ran as a commercial enterprise. In such cases, a professional chef or someone with similar knowledge would oversee the purchase and layout. In addition to offering products from all of the world's leading brands, we have an in-house Design Team who can design and create products uniquely for you. You are a real part of this process, alongside our team of designers who are incredibly experienced, creatively talented and well versed in the process of bringing your ideas to life on the page. What items can be made ‘uniquely yours’ Can I start from scratch? We can alter the majority of products to your tastes or create a new product especially for you. How are the designs presented and created? Using multiple artistic techniques, our team will listen to your style preferences and ideas and begin the design journey with you. Initially, we will research your thoughts and begin to transform them into hand-sketches, pattern ideas or motifs. We'll then take your feedback to create 2D artwork, final renders or design concepts. The design process is entirely personal to you; you can guide us on your preferred presentation method. What is 'GF Uniquely Yours'? Glancy Fawcett Uniquely Yours is our personal service where we design and create products specifically for your tastes. From the knowledge and experience of our Design team, we work with your design tastes, concepts and interior style renders to help make their vision a reality. This exclusive service leads to the creation of truly unique designs, tailored to precisely match your requirements. Can you add my project's motif to existing designs? Do I need to visit you for this service? We always recommend our clients visit us in person as there is no experience quite like seeing and feeling the products you wish to purchase, all in one place in complete privacy. We can also, however, work with you at a convenient location, or remotely if needed - whatever suits you best. Do you check my items before delivery? Our experienced Logistics team, work to the highest standards of quality control. Every product that arrives at our warehouse will go through an extensive quality control checking process. Each item is unpacked, inspected, measured and then repacked. Any product that doesn't meet the necessary standards is flagged to the manufacturer for discussion and replaced if necessary. We aim to ensure that all products meet our high standards and the manufacturer's standards, making sure that they arrive at their destination with the quality you would expect. For full details on our process, please request our Service Level Agreements document. How will you pack my order? Once all of the items have been through our quality control process, we will pack everything for delivery, as per your requirements. We want to make sure your receiving of the goods is as efficient as possible. We have established the best way to pack our boxes is according to the area, cabin or room that the products inside are intended for, allowing precise and easy unpacking. Boxes will be labelled to identify their contents and their intended location. We deliver worldwide. We have great communicative relationships with our suppliers, and logistics contractors established over many years to ensure the safe and timely delivery of all goods. We use our own contracted delivery vehicles for consignments within Europe to achieve this goal. For deliveries outside Europe, and for smaller shipments, we use either UPS or a dedicated international shipping company who will carry out door-to-door deliveries anywhere in the world. Depending on your selected products, and the size of your project, we offer a tailored discount structure to ensure you are getting the most from our partnership. What are your payment terms, how can I make a payment? Our normal payment terms are 50% on invoice and the remainder on delivery. We usually receive payment via bank transfer, but we can accept credit card payments or cheques up to £5,000. On large financial payments, we use a tailored payment method to ensure a smooth and secure transfer of funds. How are you competitive against other outfitters?